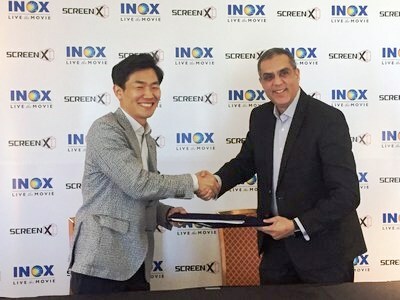 India's fastest growing multiplex operators INOX Leisure Ltd (INOX) today signed a deal with CJ 4DPLEX for bringing the multi-projection technology ScreenX to India. ScreenX is the world's first multi-projection theatre technology designed to enhance the movie-going experience offering a 270-degree view. ScreenX allows the audience to go beyond theme of the traditional movie screen, utilizing a proprietary system to expand select scenes of feature films to the left and right walls on each side. The deal was signed on the sidelines of CinemaCon, world's largest event for the movie theatre industry taking place in Las Vegas from 1st-4th April. The deployment of ScreenX technology would allow the movie scene to spread beyond the cinema screen on to the three sides of the cinema wall and offer a spectacular view. While offering a maximized immersive experience, the 270-degree view would not only amplify the emotional aspect, but also enhance the entertainment value of the content. INOX has signed a deal with CJ 4DPLEX today and is all set to bring the first ScreenX in India.